Many dogs seem to have a natural affinity with water, and I believe that all dogs can swim, even if some prefer not to. When I was a child our dog used to love to swim in the Thames. We would throw sticks into the river for her to fetch but if we accidentally threw them too far, where the current was too strong, she always knew when to give up and turn round. She knew the limits of how far out she could swim and still get back to the bank. She never got it wrong, and never seemed to be in any kind of danger no matter how fast the river was flowing. At the time I took this for granted and never gave it a second thought but now it seems quite remarkable. 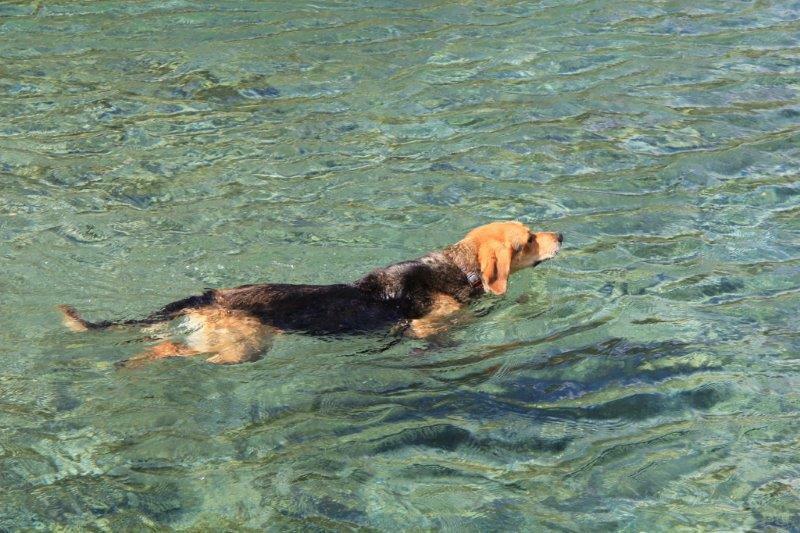 The photo here is not of my dog but of a dear friend’s dog Pintga happily swimming in a river in France where she lives. This entry was posted in water as freedom, wild swimming. Bookmark the permalink. ← Virginia Woolf on the beach at Studland, Dorset.